I can and will do better. He's got the right idea but didn't have enough medium for the stems to grow through and allow space for the tubers to naturally develop on the stems. The sketch shows that the seed potato produces all of the feeder roots for the plant. The foliage gathers energy from the sun and the tubers only job is to grow. 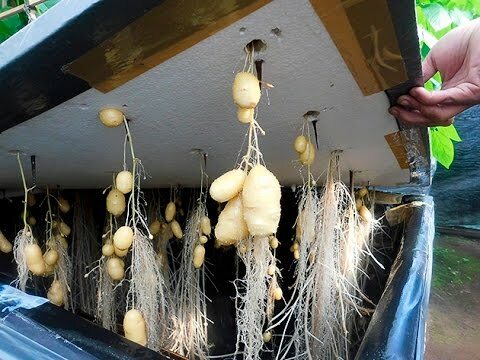 Other hydro grows try to restrict tubers inside the actual nutrient tank. To my mind, this approach is a bit arse-around-face. Can you see the middle root and the potato desperately trying to escape? Why can't the grower see the obvious? The Loneliness of the Long Distance Runner is a 1962 British coming-of-age film based on the short story of the same name. The Loneliness of the Long Distance Gardener should make a good 2019 Internet era book/film title. The film poster's by-line is "you can play it by rules... or you can play it by ear – WHAT COUNTS is that you play it right for you..."
This is the spud I'm going to use for my hydro and soil experiment - I think it will play right for me. Grow potato of your own Accord; a dependable variety big on taste in the kitchen. So versatile Accord is great as new potatoes, in potato salads and even as chips with fish and chip shops around the country choosing this variety for their prize chips. With a waxy texture, they hold their shape on boiling, so they don’t disintegrate and go mushy. Similarly with roasting; they crisp up well. In the garden they perform so well; naturally resistant to scab they come out of the ground looking clean and blemish-free. Parcel tracking indicates the pack has been stuck in the Belfast sorting office for 4 days. Hopefully, they'll be well chitted when they eventually get delivered. Yodal finally turned up and delivered. The pack contain 26 seed spuds of outstanding quality and some are already starting to chit. I put them in small pots filled with slightly moist compost making sure they were root node down. In 2 or 3 weeks time they should have developed a healthy root system and be ready for transfer to my Kratky tank. Finished building the spud boxes for the three experiments. Kratky grow box fully waterproof and lightproof. Each box is .9m square with the EPS separated from the water and soil. On average when growing old school I get 1kg eatable size spuds per first early seed potato. So, by keeping the grow area the same and using the same Marshalls seed spuds I should get a good comparison and data for my experiment. Any update on this Jack? I grew cucumbers and tomatoes with the Kratky method a few years back. The tom plants didn't get very big but I've since learned that I should have had a bigger container for them so my fault. As a skint gardener now, I'm planning on trying Kratky again alongside traditional growing just to save on compost really. I have pots and planters just not enough growing medium. I wouldn't have thought about trying potatoes tbh, I did see a video where someone tried carrots unsuccessfully. Anyway, I'd be interested in your progress.